Our easy 5-Ingredient Buffalo Bacon Roasted Cauliflower is an exciting snack for game day parties! 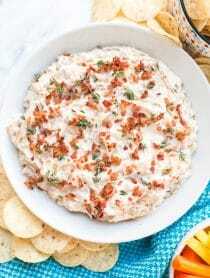 With the biggest football game of the year right around the corner, this week I’ve got party food on my mind. 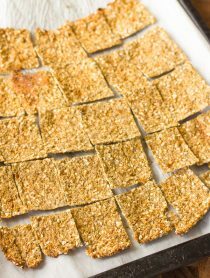 We tend to crave bold tantalizing snacks with tons of texture and comforting appeal. Although buffalo wings and pizza are usually our go-to game day snacks, it’s fun to mix things up, and even sneak in a few veggies here and there. 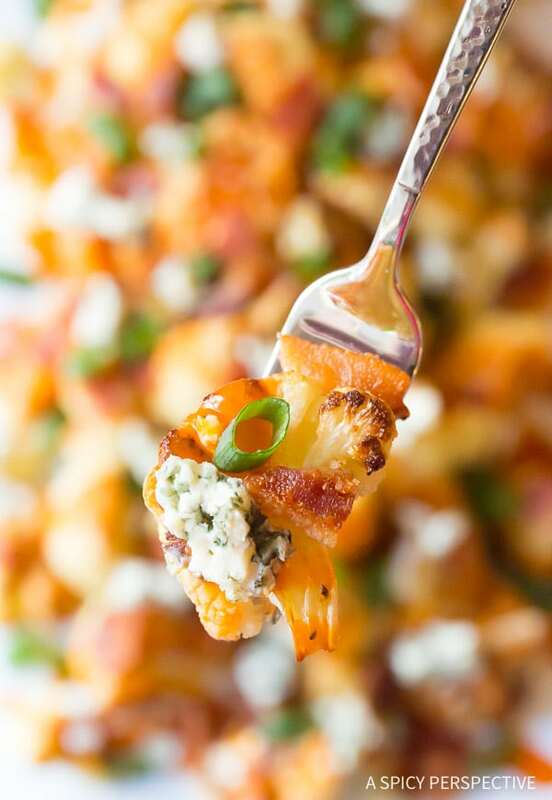 Today’s Buffalo Bacon Roasted Cauliflower offers the spicy flavors of buffalo chicken wings, yet is much lighter and leaner, since the base of the recipe is cauliflower. 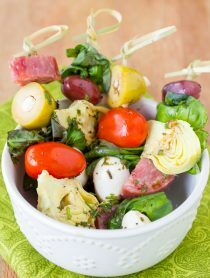 In fact, this recipe has only 102 calories, 7 grams of fat, and 3.2 grams of carbs per serving! 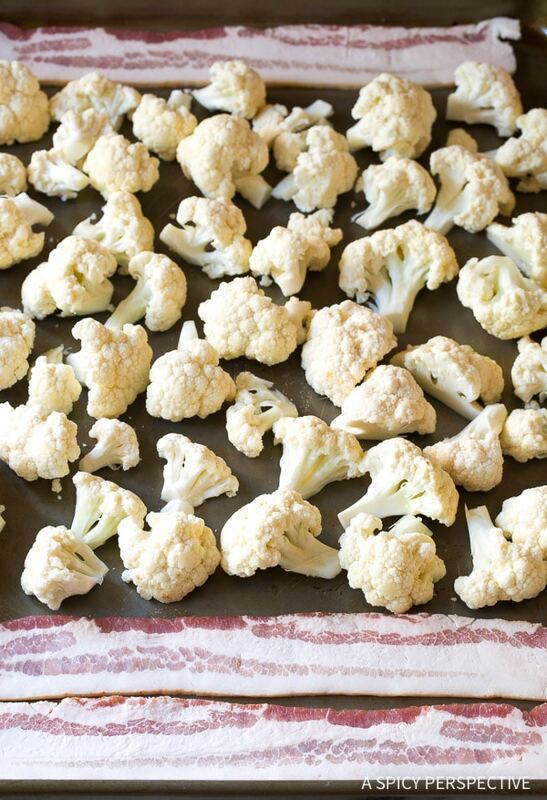 The cauliflower is roasted on a baking sheet with a few strips of bacon. As the bacon crisps in the oven, the cauliflower sizzles in the bacon grease to give it a little fatty richness. 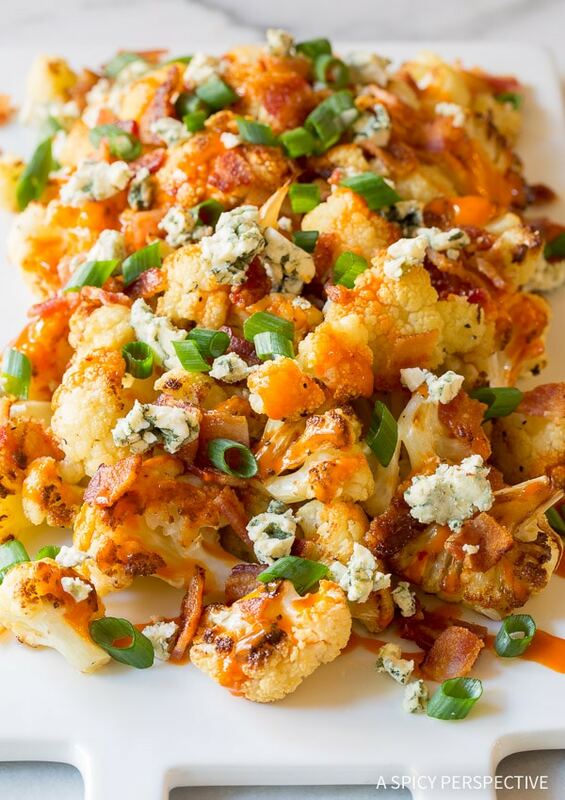 Then the cauliflower is drizzled with buffalo wing sauce, and sprinkled with the crumbled bacon, bits of blue cheese, and scallions. Buffalo Bacon Roasted Cauliflower tastes decadent, yet is easy on the waistline, making it the perfect party snack for those sticking to their New Year’s resolutions. You don’t have to feel like you’re out of the “good snacks” this year. 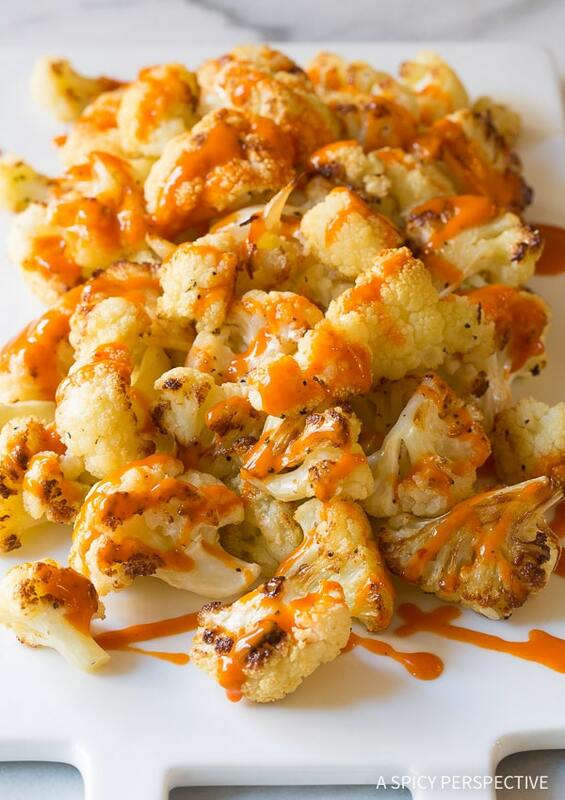 This Buffalo Bacon Roasted Cauliflower recipe with have everyone reaching for their veggies! 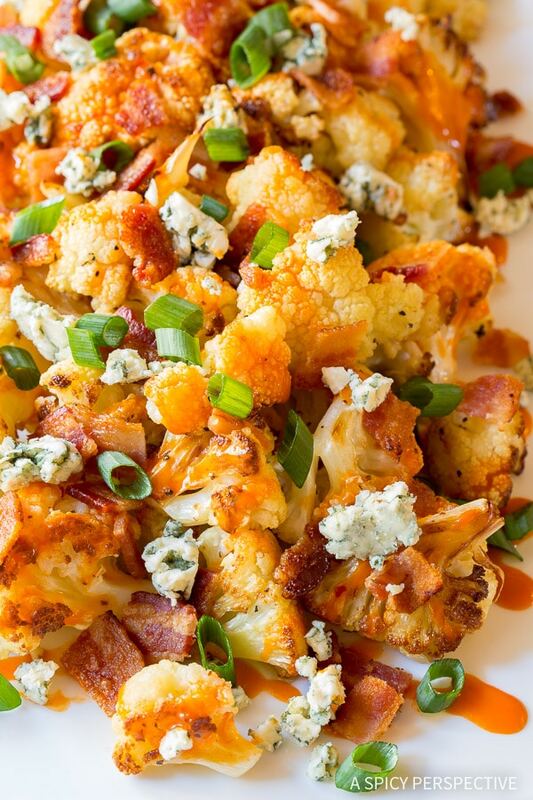 Buffalo Bacon Roasted Cauliflower Recipe - Tender roasted cauliflower drizzled in buffalo sauce and sprinkled with creamy blue cheese and bacon! 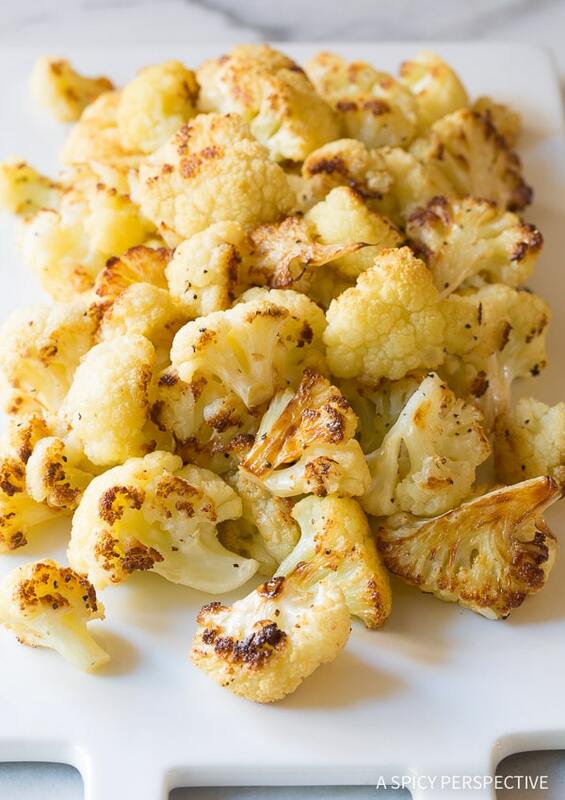 Preheat the oven to 450 degrees F. Cut the cauliflower into florets, removing most of the stems. Place the strips of bacon on the ends of a large rimmed 13x18 inch baking sheet. 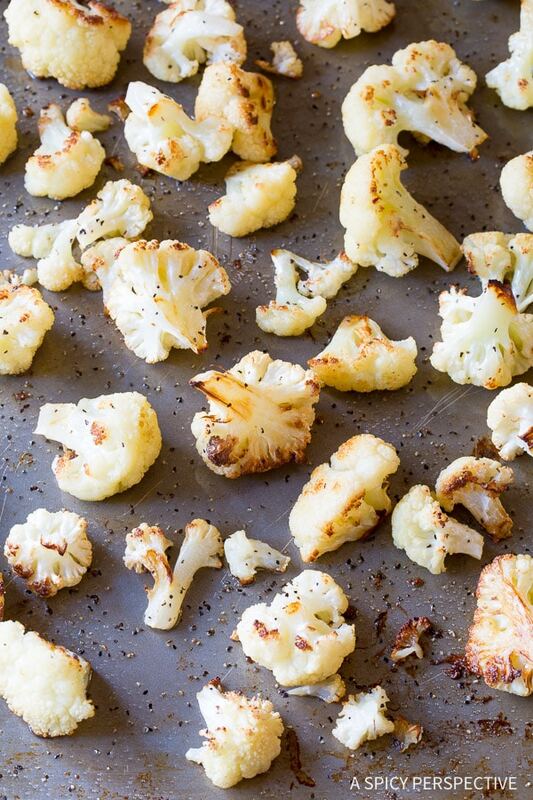 Spread the cauliflower florets in the middle of the baking sheet. Roast in the oven for 15-20 minutes, until the bacon is red and crispy. Remove the bacon with tongs and place on a paper towel lined plate to drain. Toss the cauliflower in the bacon grease and spread back out. Then sprinkle with salt and pepper. Roast another 5 minutes until the cauliflower is crispy around the edges, yet tender in the center. Move the cauliflower to a platter. Drizzle with buffalo wing sauce. Cut (or crumble) the bacon and sprinkle over the top of the cauliflower. Then sprinkle crumbled blue cheese and chopped scallions over the top. Serve warm. absolutely delicious! Easy way to use cauliflower. Roasting it brings out the flavor and you don’t have that mushy texture you get from steaming it. I made it as is written but you could probably change the sauce to teriyaki or a salsa verde for different ethnic flare.